Happy Cupcake Monday! I used Taylor's sketch, TECC65, for my card today. I was in need of a masculine birthday card, so I whipped this one up quickly. It is one of the few lightly embellished, flat cards you'll ever see me make! 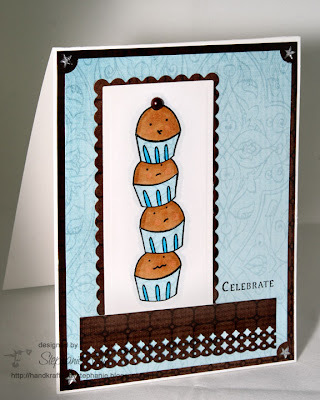 I stamped the "tower" of cuppie image from Sweet Celebration, which was perfect for the layout that I envisioned with a tall narrow image, colored them and paper-pieced the bottom of them with the same patterned paper I used for my main background. The patterned paper that I used (both the blue and brown) are part of the digital kit, Bloom & Grown, by Songbird Avenue. Proceeds from kit purchases with be donated to Autism Speaks. As an added bonus, between now and April 30, both Jessica Sprague and Ali Edwards will match each kit purchase with a $2 donation to Autism Speaks on top of what is already being donated. The kit is full of beautiful coordinating elements and patterned papers, so I just couldn't pass up the chance to make a contribution to such a wonderful cause. Accessories: Long Rectangle Nestabilities (Spellbinders), Cuttlebug (Provo Craft), Markers (Copic), Parisian border punch (EK Success), Ticket punch (SU! ), Brown pearl (Kaisercraft), Star rhinestones. How pretty! I love that blue paper. The cupcakes are always cute too.